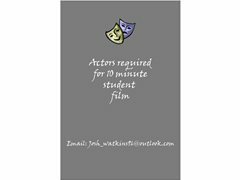 Acting Jobs>Short Film Jobs>Actor and Actress for Short Film "I Got You"
Actor and Actress for Short Film "I Got You"
Two friends embark on a journey of self discovery. Destiny is struck with depression as she misses her classes' graduation. Her friend, Michael goes to comfort her. This movie requires two roles.